Welcome to our new and improved Disney Princess Pages - we have compiled this list of Disney Princess locations to help you score major “Super-Parent” points on your next family vacation to Walt Disney World Resort and theme parks in Orlando, Florida. Use the buttons below to search by specific princess or to find all of the Disney Princess options at a specific theme park or Disney World location. 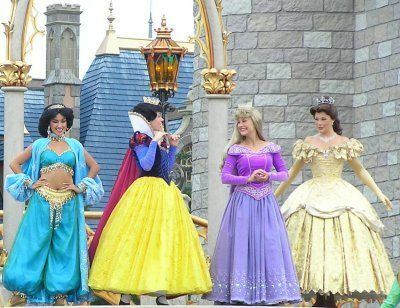 We've included princess themed rides, shows, attractions, princess meals, and places where you can meet the princesses. TIP: You will avoid tears of disappointment if do not promise your little one that they will meet any specific princess until you've secured a Princess Meet-and-Greet FASTPASS+ reservations or a Princess Character Meal reservation. You can tell them that they will see lots of princesses at Disney World. You can use the links above to search by individual princess or you can use these links to find all of the Disney Princess attractions, activities and experiences available at a particular Disney World location. Disney has two Bibbidi Bobbidi Boutique salons where little girls can get princess make-overs that vary from just hair and make-up to packages that include princess costumes. There is an extra charge associated with this experience. Click here for more details.